Reading and share top 6 famous quotes and sayings about Green Gables by famous authors and people. 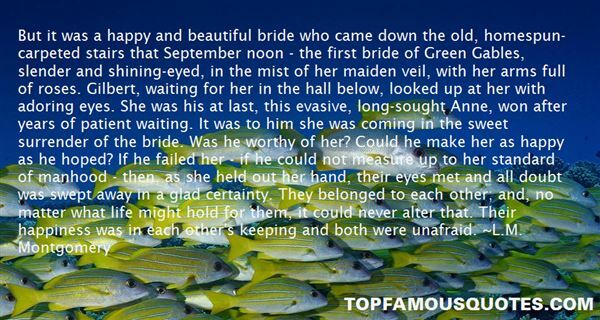 Browse top 6 famous quotes and sayings about Green Gables by most favorite authors. 1. "But pearls are for tears, the old legend says," Gilbert had objected. "I'm not afraid of that. And tears can be happy as well as sad. My very happiest moments have been when I had tears in my eyes—when Marilla told me I might stay at Green Gables—when Matthew gave me the first pretty dress I ever had—when I heard that you were going to recover from the fever. So give me pearls for our troth ring, Gilbert, and I'll willingly accept the sorrow of life with its joy." -Anne"
2. "But it was a happy and beautiful bride who came down the old, homespun-carpeted stairs that September noon - the first bride of Green Gables, slender and shining-eyed, in the mist of her maiden veil, with her arms full of roses. Gilbert, waiting for her in the hall below, looked up at her with adoring eyes. She was his at last, this evasive, long-sought Anne, won after years of patient waiting. It was to him she was coming in the sweet surrender of the bride. Was he worthy of her? Could he make her as happy as he hoped? If he failed her - if he could not measure up to her standard of manhood - then, as she held out her hand, their eyes met and all doubt was swept away in a glad certainty. They belonged to each other; and, no matter what life might hold for them, it could never alter that. Their happiness was in each other's keeping and both were unafraid." 3. "Only a few more weeks till spring . . . and a few more weeks then till summer . . . and holidays . . . and Green Gables . . . and golden sunlight on Avonlea meadows . 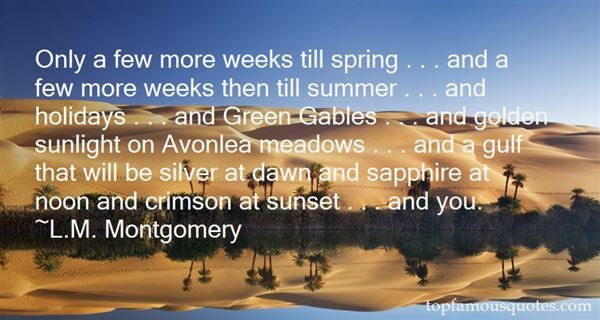 . . and a gulf that will be silver at dawn and sapphire at noon and crimson at sunset . . . and you." 4. 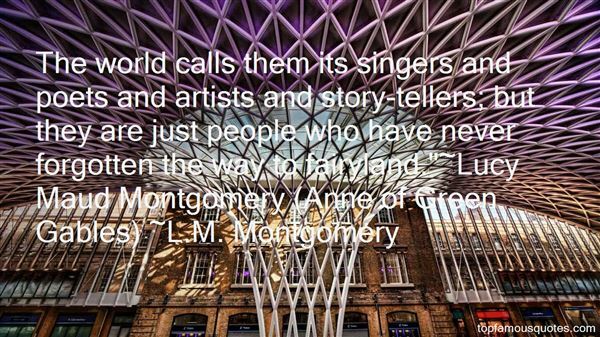 "The world calls them its singers and poets and artists and story-tellers; but they are just people who have never forgotten the way to fairyland. "~Lucy Maud Montgomery (Anne of Green Gables)"
5. "This is Leo's first night here. Leo was in charge of putting the napkins out and I notice that he put them on the right and they're supposed to go on the left. I only know this because I like to read books like Ann of Green Gables, and Little House on the Prairie, and I pick up random things like that from the stories." 6. "I read a lot of fantasy. I adored 'Anne of Green Gables'. But my favourite books as a child were probably Laura Ingalls Wilder's 'Little House' series, about a pioneer family in the mid-19th-century American west. I often thought of them as I was writing 'The Last Runaway'." Mr. Anderson:Well, maybe we all should call it a night. Congrats to the happy couples. Will there be wedding bells soon?SnowGirl:Definitely. I mean, if you help a guy kill a dwarf, he should marry you."